Larger than life characters need larger than life figures. As such, over the last 18 years, the ‘Bigfig’ has been developed to cover situations where a regular minifigure feel a bit… inadequate. Especially useful for Rock Monsters, Snow Monsters and Trolls, they have also been used to represent super sized villains such as Darkseid, Thanos, Gorilla Grodd, Dogshank and Killer Croc, and heroes such as the Hulk and Maui. Compared with regular mini figures, they have no leg or neck moment, and only in relatively recent years have they had rotating wrists. What they lack in movement, they make up for with an imposing physique. The degree of sculpted muscular definition varies, as does the amount of printing. 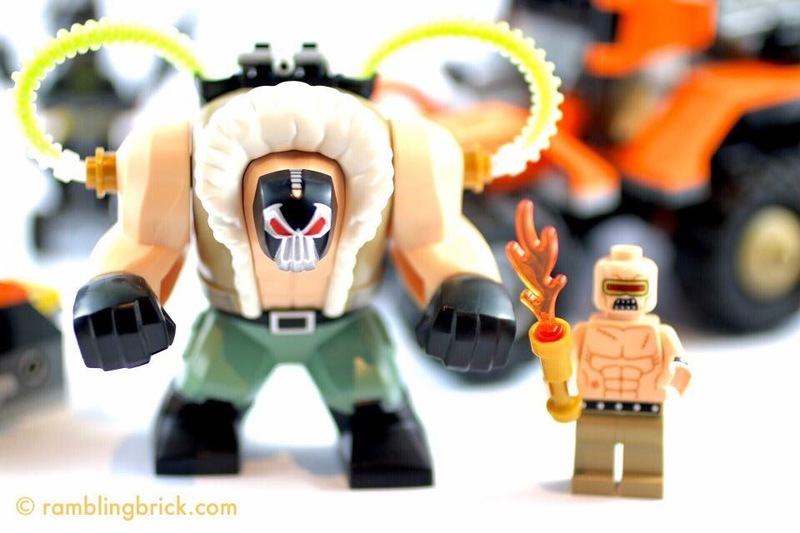 A great hulking(sic) figure, this version of Bane comes from the second wave of The LEGO Batman Movie sets, specifically 70914: Bane Toxic Truck Attack. I would like to compare the advantages and disadvantages of the moulding of this bigfig in comparison to the smaller figure, with multiple printed muscles. Fortunately, this set provides us with one of those as well, in the form of the Mutant Gang leader. We will also compare this figure with the only other bigfig currently active in my collection: Maui from Moana. As previously discussed back in February, I was not certain as to whether or not I was going to pick up any of the second wave of the LEGO Batman Movie sets. I had my key ‘classic’ villains in some form. I had Batman, Robin, and Batgirl. I have my collectable mini figures. However, I did not yet have a ‘realistic’ figure of Bane. 2017: Bane – still towering above everyone, 24 years on from his debut. Bane as a character was introduced in 1993 in the pages of Batman comics, enhanced with the mechanisms to deliver a performing enhancing substance (code named Venom) directly into his blood stream and brain. He had the intelligence and strength to break the Batman. This initial storyline, Knightfall, is what drew me into reading Batman comics almost 25 years ago. Bane was featured on many covers in that series, drawn by Kelley Jones. In these images, Bane almost surpassed cariacature: towering above all other characters on a venom fuelled rampage. I believe the record number of ‘abs’ that I ever saw him drawn with was a twelve pack, on the cover of Detective comics 666! This makes him ideal for portrayal as a bigfig, larger than all other villains in Batman’s Rogues Gallery, as well as most characters to be found around either Gotham or LEGO City. To this day, he is still portrayed in this way on the cover of comics. In other media, his character has been somewhat diluted. Bane appeared in the 1990’s animated series, as a mercenary for hire. Brought to Gotham by Rupert Thorne to remove Batman from the scene, he was defeated once his venom supply was cut off. A similar effect was seen in the Joel Shumacher Movie ‘Batman and Robin’ in 1997, where he became a henchman to Poison Ivy. The rapid deflation of Bane following his defeat is a somewhat hilarious anticlimax. Bane regained his street credibility in Christopher Nolan’s ‘The Dark Knight Rises.’ Here he is portrayed as physically powerful, a solid strategist and ruthless: nobody’s sidekick and a force to be reckoned with. This film saw Bane move on from his traditional World Championship Wrestling togs to a more practical pair of trousers, with a singlet and sheepskin jacket to stave off the Gotham Winter. He wears a facemask, allegedly providing him with anaesthetic to reduce the pain he experiences after previous trauma, in combination with the venom that enhances his strength. Bane also appears in multiple non LEGO video games, but I shall not pursue that line now. 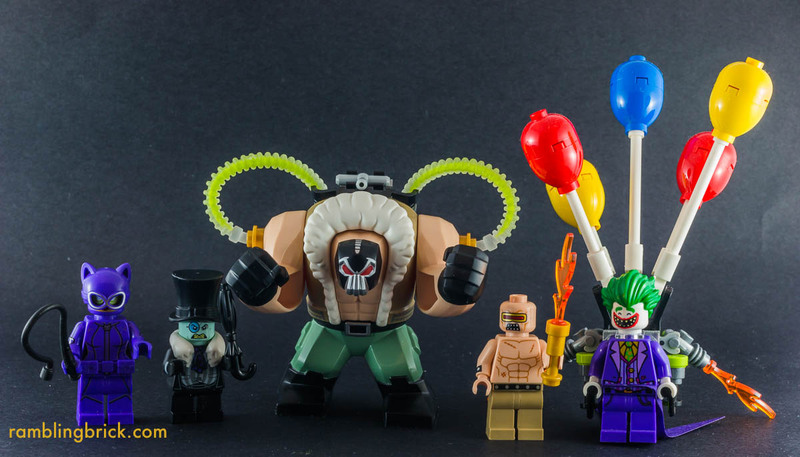 Bane has been portrayed as both the traditional’wrestler’ and Dark Knight Rises form as a minifigure. In the LEGO Batman Video Game, Bane is able to upsize to a bigfig version of the standard design. He is also a character available for LEGO Dimensions, with a small brick built venom dispenser on his back. The bigfig Bane is made up of the torso/legs/head piece, two arms, two hands and 2 technic pins to attach the arms to the body. The hands can hold both a 3.18mmbar and a one stud thick brick. Bane can hold onto standard bars, but not as securely as a regular minifigure. Let us compare our new Bane bigfig with Bane from the DC Mighty Micros Series, where for reasons I don’t quite understand, he drives a drill mobile, in competition with Robin. Neither figure has movable legs, and they both feature the wrestler mask favored in the comics and animated series. Our Mighty Micro Bane has a small Venom dispenser printed on his back, and features a hose running the drug directly to his brain. 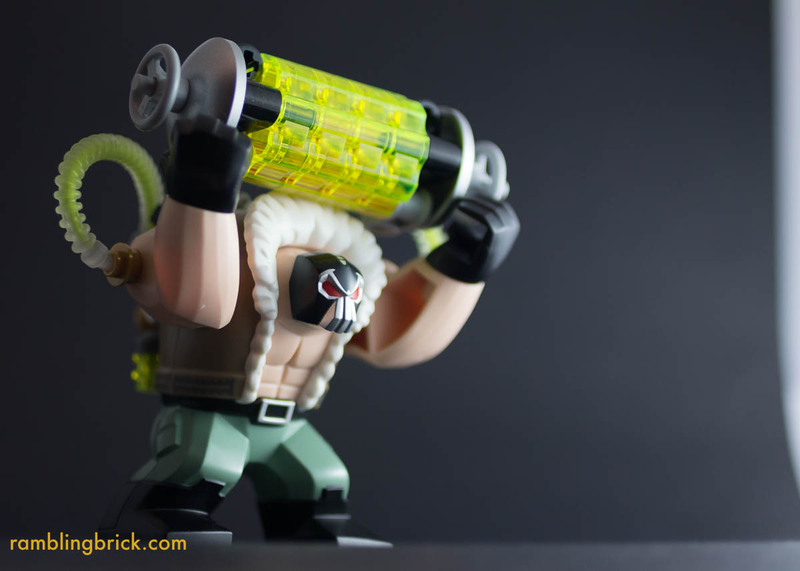 Our Bane bigfig features four studs on his back, to allow a brick built back pack, with lime green tubes delivering the drug directly to…his shoulders? The back pack allows for a more detailed, brick built venom supply. The flexhose, attached using ‘apollo’ studs, provides a vulnerability for the venom supply. Like the version of the character that featured on Kelley Jones’ covers for the comics, he appears overly muscled for his size, with the muscles on his upper back hypertrophied so much that they push his head forward. The torso is where the bigfig Bane shines. He is wearing the sheepskin coat seen in The Dark Knight Rises, with green trousers and black boots. The trousers are held up with a belt, while the jacket features a printed detail representing the stitching in the jacket. There are so many textures, grooves and printed aspects to this part that a slight alteration in lighting effects the lay of the shadows on the figure quite dramatically. The textures on Bane’s jacket and headgear mean that shadows play a significant role in the photography of this figure. Bane is of such a size that there is great scope for experimenting with depth of field while taking photographs of this figure. This is in stark distinction to either the ‘mini Bane’ or the Mutant leader. Another muscular character, based on the Leader of the Mutant Gang in The Dark Knight Returns, this character features significant musculature in addition to multiple scars on his chest. He also features a bald head with a red visor and razor sharp teeth. he is a torch made of a pearl gold telescope and small flame. If he weren’t appearing in a context where everything is vaguely humorous, I would consider him to be one of the most aggressive looking mini figures I have seen for some time. While multiple muscles are present, and printed onto the bodies, both figures are relatively plain from the point of view of additional shadow lines. The lack of a textured hair piece or backpack reduces the creative photographic opportunities afforded by the sculptured bigfig. As a minifigure representation of the character from the comics, however, he is superb! I am not planning to review the set that Maui travelled with (41150 Moana’s Ocean Voyage). However, I would like to compare him with the Bane bigfig. Compared to Bane, Maui is relatively ‘unbuff’. His torso is fairly smooth, with no specific muscle definition beyond a gentle pectoral moulding. His decoration is primarily in the form of his tattoos. His pants are flush with his body, with no detailed belt. The arms are slightly different to Bane’s, lacking the studs to bind the hoses to, but the hands use the same mold. Maui’s head, with black curly hair is where the majority of the texture occurs on this figure. Unfortunately, other than his nose, the face is smooth and round. While this fits with the nature of the character depicted in the movie, it detracts from the photographic interest of this figure. I found it a little harder to get interesting shadows to fall on Maui’s body and face, compared to Bane. I think, in fact, that Maui is based of similar molds to many of the other bigfigs, with the exception of the face/head component. While this is not removable, it appears that this is perhaps the only molding difference with some of the figures such as Thanos and Darkseid. Indeed, when examining the figures closely, it would appear that many bigfig torsos are made of three components: front, back and head. No set named after a LEGO Batman Movie villain would be complete without some form of vehicle. Bane and the Mutant Leader come with the toxic truck. The bright construction of the truck body is simple enough. The bright orange angled elements enhance the look of the vehicle, with optional stickers to make the mudguards look more battered, as well as ‘Osito’ stickers for the wing mirrors (for years, Osito, a teddy bear, was Bane’s only regular companion). 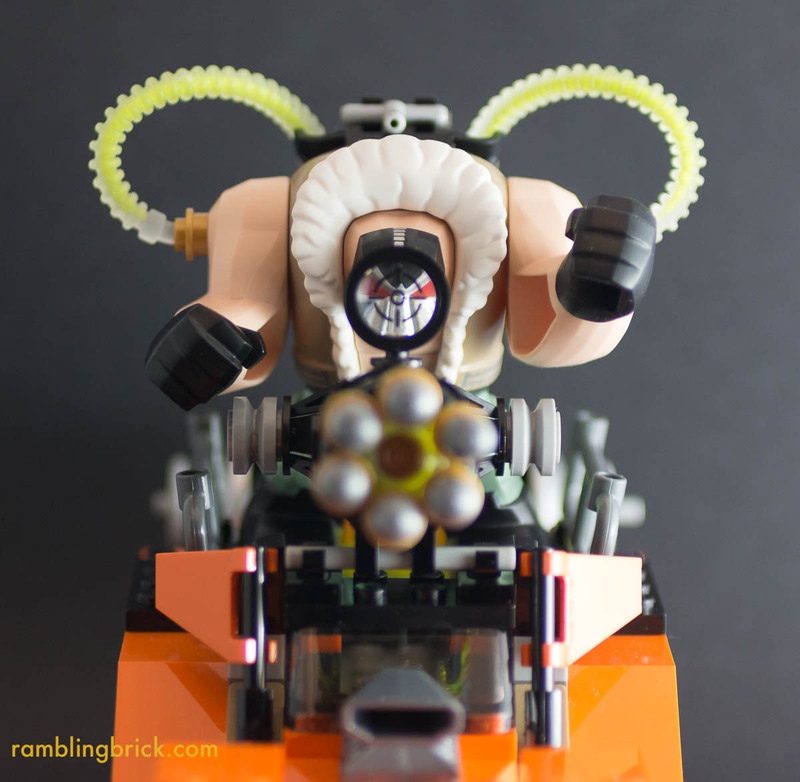 The truck is dominated by a large cannon, designed to be operated by Bane, with neon yellow and pearl silver projectiles on a rotating LEGO six shooter. The gun features a magnifying glass, with crosshairs printed on the lens. The back of the truck also carries an ominous neon yellow tank of toxic wastes, with silver dishes capping it off at both ends. This truck is a six wheeler: one of my favourite features is the way the rear wheels are placed on a pivot, to simulate suspension, as well as keep all wheels on the ground whenever possible, when the road gets a little rough. I am a little challenged by the scale of the truck, which just feels kind of weird, designed for the normal minifigure driver, with the bigfig Bane. And it also comes with handy barrels of excess waste for wreaking further havoc! It would not be a LEGO Batman movie set if there was no form of Batman (or a sdekick) present). Batman rides in the Whirlybat, a gyrocopter with a greater than fleeting resemblance to the vehicle that he flies in his first adventure, way back in 1938. The bat wings seem a little strange initially on it, but the look has grown on me. It is a very simple, but effective construction. This set has 366 elements, including a brick separator. It is priced at $AUD90, which I think is a little extreme for this set ($US49.99; €49.99, £49.99!) This is one of those sets where the figures provide the central motivation for purchasing the set. Bane is certainly a formidable figure, and the mutant gang leader is no slouch either. Batman is the same one as found in 70900 The Joker Balloon Escape, as well as others. I think this is a set best purchased with a discount if you can, especially in the Australian market, where the LEGO Batman™Movie Sets seem to be priced a little higher relative to the European prices than other current unlicensed sets. I enjoyed the build, and am only just beginning to explore the photographic opportunities that Bane provides. The vehicle is interesting, but not at a scale that will work well in a regular LEGO City. The price for this set is quite disappointing, but the contents are superb. I give it 3.5 out of 5 Arbitrary Praise Units. At a less expensive price point, it may have scored more. If you have enjoyed this review and discussion, why not comment below. Follow the Rambling brick on Facebook to keep up to date with all of the latest posts. Pretty excited for this set. Finally arrives tomorrow to our store. Fantastic News, I’m Rick James Bricks.